As always, click the images for the links. All photos are courtesy of the blog they link to! 1. I have a blog crush on Ashley Ann. Her photography is amazing, her kids are freakin' adorable, her crafts and tutorials are amazing. She is a new addition to the creative team at Design Aglow and had a cool post on iron-on possibilities, including this onesie. I know it is an iron on, but how cute is the initial in buttons? I have a zillion random buttons to use on a project like this. I'm thinking a wallhanging instead. Check her blog out too - amazing ideas and photography (and more of the cutie pie above)! 2. 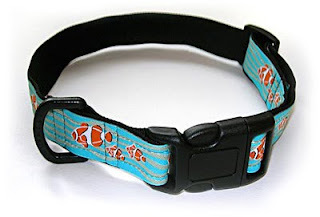 How About Orange shared a link to a tutorial to make adorable dog collars like the one below. How cute would this be in her ribbon designs! 3. I LOVE fabric. Cute cotton patterns. I buy more than I should - more than I will probably ever use. To think I can design my own and have it printed? BRILLIANT. It is called Spoonflower. It isn't as expensive as you'd think! You can buy others' designs too. 4. I saw this post on these adorable cupcake holders and thought instantly of my friend Katie. So cute! How perfect for a baby/bridal shower. 5. 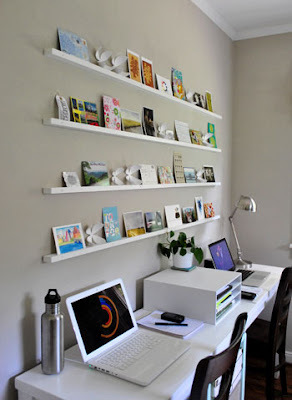 I love this postcard ledge idea from Young House Love. Mix in a few great 4x6 photos and you've got a pretty cool piece on your hands. I love how it is art, but also a memory wall!